In a separate bowl, thicken broth with cornstarch; add peanut sauce. Stir sauce into beef mixture. Cover and heat for about 5 minutes. Stir in cilantro. 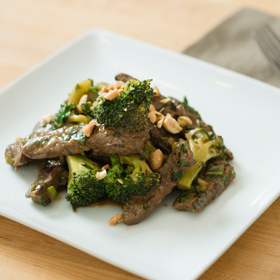 Spoon stir-fry into serving dishes and garnish with peanuts. Serve. *Cook beef to 145 degrees and let rest 3 minutes to help prevent foodborne illness. Serving size: 1/8 recipe. Amount per serving: 180 calories, 8g total fat (1.5g saturated fat), 35mg cholesterol, 11g carbohydrates, 17g protein, 3g dietary fiber, 410mg sodium.